Drivers of plug in electric vehicles will soon be able to charge up on the streets of Wisconsin&apos;s capital city. Madison Gas and Electric is the first utility in the nation to make electric vehicle charging stations publicly available, with the purchase of six such stations to be installed around the city, according to MG&E&apos;s Steve Krause. "One of the disadvantages (to electric vehicles) now is when you don&apos;t have a public charging station, is you have to either charge the car at your home, or you have to charge it a prearranged location," said Krause. "People that want to use electric cars all day long, either in town or even town to town, need a place to refuel that vehicle, and these charging stations will do that. We also have an additional bonus. All of the power that will be used to power these cars will come from renewable sources, and it will be primarily wind energy." This is a demonstration project and for now, electric vehicle drivers won&apos;t be charged for the juice. MG&E&apos;s Don Peterson said the utility sees this as a business opportunity eventually, so they&apos;ll be collecting data. For example, how many electric vehicles are out there in the Madison area? "We really don&apos;t know how many electric vehicles are out there," said Peterson. "The estimates go to anywhere from 25 to 75 vehicles." That&apos;s a number that could be increasing fairly rapidly: Peterson noted that a Madison area car dealership is already doing a brisk trade, converting Toyota Prius hybrids into all electric plug ins. 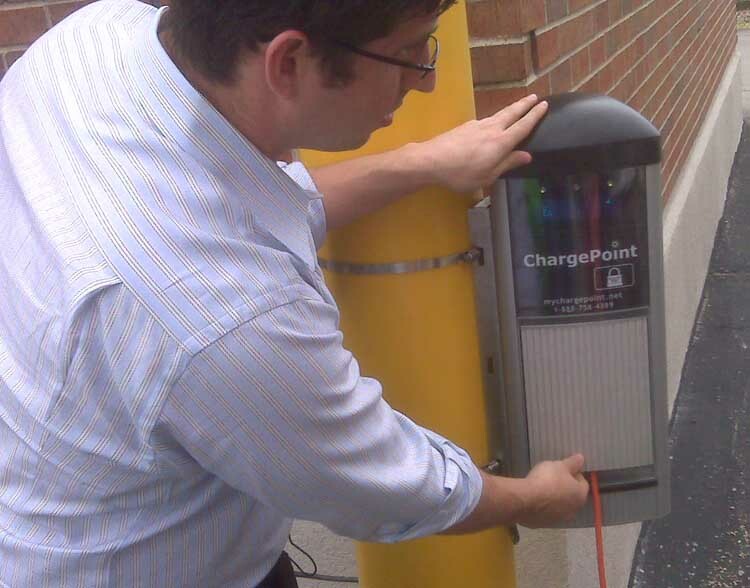 "We see this is as a business opportunity, but right now each charging station, installed, is costing somewhere between $5,000 and $10,000," said Peterson. "We&apos;re exploring avenues for grants and additional research money, but right now this is an MG&E funded program." Drivers of electric vehicles will be charged about twenty five dollars for a key fob to access the chargers. "Every car comes with a home charging station," explained Scott Emalfarb, a principal in Chicago-based Carbon Day Automotive , supplier of the chargers being used by MG&E. "We&apos;re the solution for outside your house and urban environments, people that don&apos;t have garages." Locations have not been finalized, but MG&E&apos;s Peterson says they hope to have the first charging station in place by the end of the summer.